Oh my garden, where have you been my whole life?! Who knew you were SO much fun? Clearly a 180 degree turn from my childhood point of view. Although the garden isn’t producing anything edible yet (except the basil, but we got that one already grown…), it’s a TON of fun, amazement and stress-relief and worth every minute. Our garden has grown tremendously since we first started, and I have TONS of pictures to share with you guys, but just in case you don’t want to hear about MY garden, I have some useful tips to share for YOUR garden too. 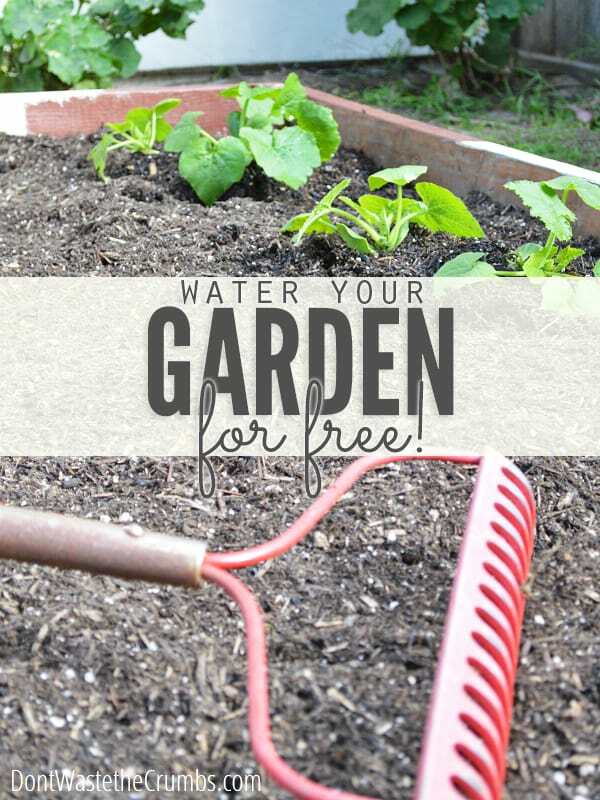 Specifically, seven ways to water the garden for free. Some of the tips are practical. Admittedly, some are slightly odd. But all are feasible, totally legit and stem from the fact that our urban garden needs water. You see, the wheels started to turn in my head one day while filling up the watering can for the third time… and I wasn’t even close to done watering. Surely, I thought, there must be a way to water our garden without having to turn on this spigot all the time. At this rate, any money we save on food will be just to off-set the current cost in water! Yes, that conversation with myself really did happen. Some of the ideas below stemmed from the ones originally shared in that first garden post, but those were off the top of my head and I hadn’t had the chance to try any of them personally. Now that we’ve been growing, watering and even increasing our garden for about two months, we’re starting to feel the pain first hand of turning on the faucet to fill up my watering can. Even with a special spray nozzle, my last water bill went up $5! And this was AFTER we employed this little trick to reduce it by $4 every month! Before you say it – yes I know $5 isn’t the end of the world. And if you account for the water displacement savings, it really only went up by $1. But if we can save that money in the first place, then not only are we saving money on water, but the food from the garden will have that much more of an impact later in the overall budget – right? And some of these ideas will have a long-term effect on savings too, well beyond gardening season. Not to mention all the energy we’re saving along the way and good stuff we’re doing for the environment. So here’s what were doing to water the garden for free. You’ll also find a few other water saving techniques we’ve employed so far, and how much they’re saving us each month in addition to the water displacement. Remember that this is an approximation, not an exact science. The numbers are pre-crunched for you, so you can see for yourself whether or not the little efforts are worth it or not. 1. Reduce the water pressure in the tub. This is the water that first comes out of the faucet as it’s getting hot. Two months ago, we would have turned the water on full blast and all the way to hot. Both Mr. Crumbs and I have always done it this way because we thought it was the fastest way to get hot water. Surely we’re not the only ones? Then one morning, I stuck a bucket under the faucet and measured how much water came out as it get hot: six quarts (1 1/2 gallons) came out. Turn water on full-blast = 1 1/2 gallons of water was wasted. The next day, I turned the water on half blast and still all the way to hot. Not only did it NOT take any longer to get hot, but it only used one gallon (four quarts) of water to do it. Turn water on half-blast = save 1/2 gallon. Taking it one step further, I reduced the pressure to the point where it was just enough to prevent a squeal from coming out of the pipes. Again, it took no longer to get hot and used only three quarts. Turn water on bare minimum = save 3/4 gallon. We pay 0.8¢ per gallon of water, so by turning the water on – just enough – we save .6¢ per person, per shower. For the Crumbs house, this equates to a savings of 42¢ per month, or $5.40 over the course of one year. 2. Reserve the water while waiting for hot water. For those with plants – indoor or out – use a simple bucket (like ours below, you can find one here) and stick it under the faucet and catch the three quarts (or more) that would ordinarily go down the drain. Then, when the water is hot, turn on the shower and take out the bucket (or move it to the other side of the shower). When you’re all dressed for the day, take that water and use it to water your plants or garden. In our experience, one day’s worth of reserved shower water (from two people) is enough to water our three tomato plants every day without having to turn on the outside faucet. Since we’re using water that would ordinarily go down the drain anyway, we’re essentially watering these tomato plants for free! 3. Reduce the water pressure while showering. Once we realized that the water got just as hot, just as fast, regardless of the water pressure, the wheels started turning and we wondered if the same thing applied to an actual shower too. Lo and behold, reducing the water pressure in the shower to halfway made NO noticeable difference in the shower itself. It took no longer to shampoo, rinse, condition, soap, scrub… and the water was coming out just as fast as before. It was as if nothing was different! So we took it a step further and tried a shower with just enough water pressure to make the water come out and avoid the squeal from the pipes – the same bare minimum experiment as I did when waiting for the water to get hot. The result was a shower that felt like the expensive “rain” showers, but again, it still didn’t take any longer to wash! The average shower uses anywhere from 2.5 to 5 gallons of water per minute. Our house is a bit older, so my guess is that we average toward the higher end. For my 10 minute shower alone, this means we’re using roughly 40 gallons of water! By reducing the water pressure to the bare minimum, we save 16¢ per person, per shower. For the Crumbs house, this equates to a savings up to $7.30 per month, or $87 over the course of one year! 4. Collect water from the shower. Remember that bucket you used to collect the water as it got? Another way to capture more water is to simply keep it in the tub with you. It’ll catch unused water and likely completely fill up while you shower. If your shower isn’t big enough to do this, simply keeping it under the faucet/shower head until you are in the shower and have fully adjusted the water temperature can save another couple quarts or so. Then move it out of the way as you shower. If you spend any time away from the water stream, like when shaving your legs or brushing your teeth, put it back. One thing to note: Allow the bucket to fill up as much as possible, but not too full. Don’t forget that you’ll have to carry a bucket full of water through the house to the back door. By collecting the excess water that would have gone down the drain anyway, we can fully saturate our zucchini and spinach plants every other day. 5. Reduce water used to boil noodles or steam vegetables. Traditional cooking methods say to use four to six quarts of water for every pound of pasta you cook. In my research, I found that pasta really only needs 1.1 times its weight in water to cook. So for one pound of pasta, you only need 17.6 ounces of water. That’s the ABSOLUTE bare minimum though, so let’s bump it up to something a bit more practical, like 20 ounces of water per pound of pasta. In either case, there are drawbacks to using such little water. Mostly, you have to stay close by and pretty much stir it the entire time. We found a happy-medium, balancing water conservation and kitchen efforts by using just two quarts of water (32 ounces) per pound of water. By doing this, we’re able to a) use less water (and save money), but also b) NOT babysit the noodles. Now you can free yourself up to cook/chop/prep as needed while the noodles cook, and you save .8¢ every time you cook a single pound of pasta. For the Crumbs House, this equates to a savings of : 3¢ per month (one pound of pasta each week), or 42¢ over the course of one year. The average person uses one quart of water to steam vegetables or when making a double boiler. This can be reduced too, down to just one or two cups without dealing with water evaporating too quickly. The savings is very small, just .001¢ for each steamed veggie, but if you could save 5¢ if you did this once a week for a year. 6. Reserve the water from boiled noodles or steamed vegetables. Just for kicks (actually, for this post, lol), I measured how much water was left after boiling one pound of noodles in three quarts of water. What was left really surprised me – over two quarts!! Using this as a guide, it’s fair to say that when you boil pasta, 3/4 of the water is leftover after you drain the noodles. Depending on how much water you use to boil your noodles, this could be as little as six cups, or as much as 4 1/2 quarts! Instead of dumping this water down the drain, set it aside to cool and water your plants with it. The starches in the water will kinda coagulate, so don’t use this water in a watering can or it will clog up the holes. Just use a regular cup instead. Despite using less water in the first place (two quarts now instead of the usual three), the leftover water is just enough to water our two rows of lettuce 2-3 times each week. Not to sound like a broken record, but since this water would ordinarily go down the drain, we’re watering our lettuce for free! 7. Save the water from drinking glasses at the end of the day. Each family member has their own glass for the day and when the day is over, whatever water is leftover is usually just poured down the drain. Instead of wasting this water, use it to water the plants! Granted, we don’t usually have too much leftover – maybe just a cup or two. But this idea includes leftover water from bike rides, hikes or running errands. Although not much, it’s turning out to be enough to water the inside plants and seedlings, every other day. You will want to check your local laws on collecting rain water. Odd as it may seem there are regulations in some states about when or how much rain water you can collect. At first, we collected the water with buckets that we normally used for washing the cars. 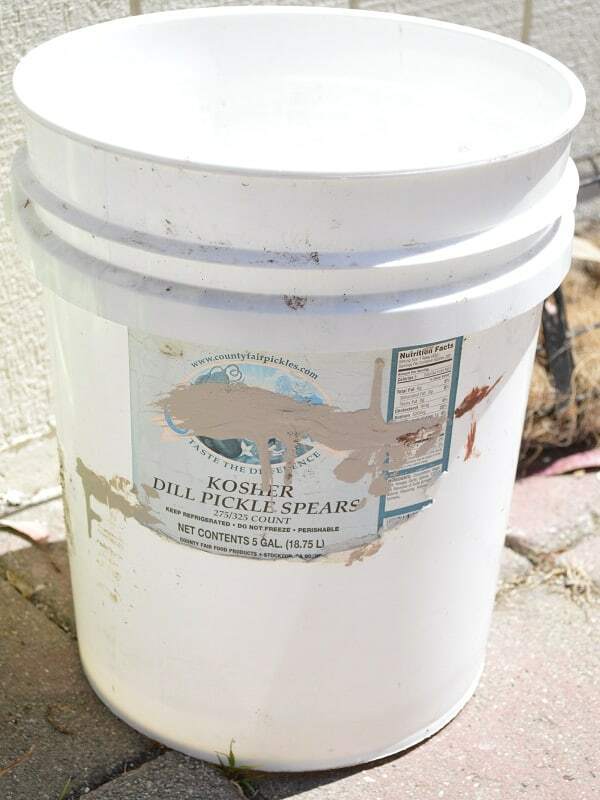 Since that poses an issue when we want to wash a car (and the bucket is in use), and it leaves the rags/sponges/soap scattered on the garage floor instead of put away on a shelf, a simple (and completely unglamorous) $1 bucket from the local dollar store was the solution. That’s the blue bucket up top. Both Mr. Crumbs and I each keep one of those buckets in the shower and we’re both using the minimum water pressure approach. Part of my daily routine is to collect the water from these buckets and take them out back. Once they’re outside, I fill up the watering can first, and then a big five gallon bucket that once held pickling cucumbers (the paint is a by-product of the kids helping us paint in the backyard). You don’t have to run out and buy buckets though. Try using what you have on hand first – any unused container will work! You can also check with friends, family or Craigslist to see if anyone has anything to help you capture and hold water through this gardening season. With a pair of open and looking eyes, you can do this for free! By doing this, we have yet to turn on the water spigot outside for the past four weeks or so. In essence, we’re saving nearly $8 off our monthly water bill (roughly $23%) AND we’re watering the garden for free!! Little actions can really add up to save over time. What small steps are you taking to save water for your own garden? « 36 Ways to Use Whey and 5 Ways to Make It! Great ideas for water savings. With so much of the western US suffering drought, this is especially timely. In addition to all those things I also turn off the shower when I shampoo my hair and turn it back on to rinse. I also use water from mopping the floors and rinsing dishes to water my plants. I am trying to conserve all the water I can in this drought . Those chemical you add on is not harmful to the plant,don’t they? I use boiling water to wash the floor, It’s just like steam without spending $ on a steamer and no chemicals to hurt the environment. We lived on the Monterey Peninsula for 48 years. We always conserved water due to drought conditions. We’d save our 1 gallon milk jugs, fill them with water from the shower or other places in the house where we got hot water, and store them for later use. We always had water for houseplants, filling a bird bath, etc. I am looking for the water saving tips can someone help me? My daughter is on city water and a VERY tight budget. She does the container in the shower thing and just dumps it in her washer for the next load of laundry. It does not matter if a bit of soap gets in it because she’s going to add soap anyways. I have a well and have never had a running out of water problem but I started using a container to catch the shower water and I use it to force flush the toilet whenever the container is full, which is usually once a day. I do not use it in the washer because I live alone and only do laundry every week or two (that’s what happens when you have a super capacity washer and are only doing laundry for one person) and I do not want that water just sitting there getting nasty. I also do not have a garden, at least not yet, but am considering one this year. I know, it is getting late in the year to start one but I should be able to get some things out of it even if I am behind planting schedule. Hope these water saving ideas help for the future when you do not need the water for the garden. I don’t mind at all Shirley! If I may add another idea, the water from the shower will be great for mopping as well! Aha! That is a great idea. I could have done that this morning when I mopped the kitchen, lol! LOL, no Jen, I don’t think a bit of slobber has ever hurt a plant! Thank YOU for your tips as well! I’m a canner, and almost always save my water for the gardens – after it has completely cooled, of course. 🙂 It ends up being quite a bit of water, as I typically can 300-400 jars per year. Fantastic idea TJ! I never thought of that one! Water: when I bought this house about 7 years ago, it was the first time in my 70+ years to pay for water. We had a well. So, I started collecting the water every time I needed hot water to come from the other side of the house to the kitchen. 6 quarts. We4ll, I filter that water for all cooking and drinking. I have a compost pile out front, I have trouble walking, so I can walk to the tiny front porch and my compost pile is down one story nearly. I live on a hill. I put the dish pan water out there, and on plants around the porch. Next, during the winter, the collection of composting went into an old pitcher, so I would take the compost matter, put in the old blender and blend with the dishpan water. I am, after being ill for 2 years, making a ‘bottle’ or what ever I can get hold of garden. I have an awning that pours rain water into a big garbage can and a broken waste basket from the nursing home. I collect the gallon jugs from vinegar, put them in each of these rain catchers, fill up and sit under the shed with lids off, water will be scarce here in NE TN when ever it warms up. I tried making the dish liquid, forget it. I use half a dishpan of hot water, washing soda and Dr. Bonner’s liquid soap. Wash one die at a time, put in other dish pan with hot water and white vinegar, dishes are clean, left to dry on counter, I put the first dishpan of water in compost, on flowers, plants. #2, I use half to rinse #1 pan, and leave rest for the dirty dishes during the day, keep them soaking. I cannot stand long, so can only do dishes once a day. Works for me Yes the water coming out fast is wasted. I have always been very frugal with water, so make clothes go a little longer before throwing in wash. I mean, I hang them up, air them out, wear the same slacks out side a few more times, only get dirty gardening anyhow. Catch the water from all hot faucets. Also, like you said, the water from the stove, why not recycle it on to our ground rather than down the sewer. If I had my way, I would have a blue water system set up here. Also, I would love to have my kitchen sink drain into my compost pile or garden area. With an insinkerator, walla1 compost out the pipe and NO standing on shelf or transporting. Years ago, another water saver was only a 2 minute shower. Wet yourself, turn off the water, soap up and rinse. I did get to read all the other remarks, probably am repeating some. But I am a conservative person. One time I had the water company come out, my bill said I did not use any water. I had conserved so much, it did not register. So, I use a little more now and recycle. I may put some of these tips into action myself, thanks for posting! I have two kids and two dogs and myself, and while I don’t use a whole lot of water from the tap, any bit I can conserve will lower my water bill and ease the budget by that much! I have another ideas about. How to use the collected water. You can also use the collected water to flush your toilet. Wow, Nancy, you sound like one smart lady. I’ve used some of your tips and will remember the rest for the future! Can you imagine what the world would be like (think CA) if we all did this! The water companies would spend all their time checking out people’s bills! Wow , the last line said it all. Thank you thank you! When I was a kid my mom had my dad rig up a pvc pipe to drain the water from the washing machine into the garden. That’s a lot of water…fast. Oh gosh, I bet! Even more so if you’re in an area that gets lots of rain! Been doing that for years. Even take the soapy bath water and water the plants with it. The nitrogen is helpful to your plants. Yes – the nitrogen is! Is soapy water “safe” for edible plants? Like the stuff from the shower or the washer, if one is using traditional detergents or soaps? I’m less concerned about it killing the plant – because obviously, if it kills the plant, I’ll know enough not to use it – and more concerned about anything leaching into the plant that could be harmful if ingested. “Gray” water, or water used for washing dishes, clothes, and people is considered completely safe. Water used in a toilet or to wash diapers is not. One way you can successfully use less water to cook pasta also will save you a little bit on electricity. After the water comes to a boil, add the pasta and return it to a boil. Stir, cover with a lid, and turn off the burner. The pasta will be cooked in about ten minutes. You might want to stir it a couple of times so that it does not stick together. I have been doing this for several years and it cooks the pasta just the same as if it were boiling the entire time. I have been doing some research on saving and using the water that drips from my A/C window units. From what I have found it’s safe and good to use for watering plants and gardens and you can also save the water from a traditional condenser unit A/C as well. Needless to say we now have buckets sitting under all the A/C’s. I have found the cheapest way to get buckets is to ask at your grocery stores bakery. The glazes and icings they use come in a variety of buckets from 1 gall up to 5 gallons. I leave them out in the sun for a day or two with the lids off to dry. Once dry the left over stuff inside just scraps off. My local stores giv them away free. Wow! That’s a fantastic tip Aubrey! I’ll be sure to ask the next time I’m there. Thanks so much for sharing! Great Ideas…I do save my water from the sink after washing the dishes. I take it to my porch (in pots or empty milk jugs and water the plants that are in the porch beds. I have a wrap around porch and it takes a lot of water to keep them happy. I, also, save the water from when I boil or steam veggies…Some I save for soup and others (like corn on the cob water) go to the porch beds and flower pots scattered on the porch. I have buckets (white 5 gallon ones), scattered around the yard for watering the gardens. Rain water is free ! Gutter barrels are Priceless and can be obtained for free if you have connections with a farmer, factory or someone that has one that is not using it. Even yard sales for cheap ! Great ideas Patti! I made brussel sprouts for dinner the other night and all the ‘waste’ went to the garden: trimmings from the sprouts and water for boiling. My bed is starting to look a bit better! Hey, not sure if already mentioned, but don’t forget your basement dehumidifier water! It’s great for those indoor plants, and even for fish tanks as it’s semi- filtered!! We live in a humid area and I use this on my gardens that are closer to the house. My friend is a water “nazi”! She doesn’t mind the title either. She has bowls or buckets in each sink to catch hand washing water to put in the clothes washer or out to her plants. She is working on growing permaculture. Things that you get started and don’t need any more water after being established. If it grows in her yard, it’s hardy! Because they will be neglected. That’s what I need in my yard! She is learning about the native plants for her area and which weeds are edible. I have sampled an interesting assortment of foods at her house. How about tumbleweed tea? Not too bad… She uses malva like spinach. It’s an anti-inflammatory. To learn more about her frugal ways, check out her blog at HemetSunshine.wordpress.com. They way I figure, if she’s going to do all the research I might as well take advantage of it! Our average yearly rain is around 16″. That’s it! I’m going to send her a link to your article. Is it two quarts to boil a pound of pasta or is it 32 ounces? I believe I read two quarts Bethany – so 64 ounces. Most packages say 4-5 quarts, but you can get away with half of that! I was a little surprised that your first tip wasn’t using a rain barrel. Our township has classes that residents sign up for. They give you a rain barrel and all the hardware to go with it. You set up everything during the class, learn lots of info about saving water and all you need to do is take the rain barrel home and place it where the downspouts come from the gutters. It is so great because you can attach your hose right to the rain barrel and water away. Please check out if your township does this too. If not I am sure the info is found on google. Saving natural resources is so importnat! LOL, that’s because we live in California and it’s not raining, lol!! I’ll be sure to ask our local water company though – they’re all about conserving with the drought! I looked through all of the comments but didn’t see if you have soft water that is attached to the cold and hot water. I thought that the salt that is used to make the water soft will kill the plants. Also what was mentioned when mopping your floors the leftover from that to use for water plants. What about the cleaner that you use will that not be hard on the plants too? If you live in a climate that needs air conditioning and has humidity, place a large container under the drain of the evaporator and you will have upwards to 20 gallons a day. Make sure that any overflow drains into the floor drain, if you have a basement. Wow – that’s a huge amount of water savings. Thank you David! Any ideas concerning soft water usage for pants and the landscaping? We have it indoors for the plumbing of the house. Do not drink it but do use it to cook. We are trying to conserve water and live in CA. where we are now being rationed to 2 days a week for 20 minutes. Any tips would be appreciated! Error! This my correct e-mail…oops! Along with the suggestion about collecting the ends of water bottles and glasses of water into a jug to be used on watering the plants later – If I happen to drop any ice out of the ice maker, accidentally, I pick up the cubes and drop them in a nearby house plant (or in the jug of odd water, waiting to be used). I used to garden on the desert where we had to conserve water to garden. If you rent, this may not be ok’d by your landlord, but may be worth a try. Both the shower (or bath) and the washer put out what is called “gray water”. You recycle the water rather than catch just the unused. We used to produce 100 to 300 gallons of used water daily that went directly into the garden through drain pipes. This was more than enough for the garden allowing us to also raise citrus and almond trees. Now that we live in a wetter climate we are also able to capture rainwater. The only water that is not recycled is from the toilet or the dishwasher for health reasons. How did you get your grey water to the garden George? We rent, and I seriously doubt our landlord would allow us to do any modifications, but we hope of owning a house one day so the ideas will come in handy! Best use I have for collected shower water is toilet flushing. They are right next to each other so no long distance hauling. If you are going to use it on plants do a beauty treatment of coffee grounds and Epson salts (magnesium). Your skin will glow and your plants will act like they had a dose of miracle grow. Generally, castille soap and espons salts for a scrub can be used for cleaning near everything. Also under my kitchen sink I have installed a spigot then when turned run right outside and gathers in a covered barrel. Since my kitchen is on the second floor, it is a easy way to water my figs, herbs, greens and grapes growing close to the house. If you are rushed in the kitchen to put cooking water on the garden, just put it in the freezer (along with your egg shells, coffee grounds) then when you have time it is in a form that easily tucks under leaves for watering. Pretty good on the writer that got the utilities super low. The lower pressure in the tub method really only works if you have a tankless water heater that is close to the spigot. In that case the slower flow of water is more efficient as the water that is flowing through the heater elements has a longer exposure time to the heat and greater chance of heating up. With a traditional “tank style” water heater, regardless of the pressure you use, the amount of unheated water is the volume of the water pipe between the heater tank and the spigot. The same volume whatever the flow rate. The collection of that water is still a good idea whichever style water heater you have though. I must respectfully disagree Dan. We have a traditional tank style water heater and I’ve personally measured how much water comes out of the bucket – that’s how I shared the tip above! If you put it on full blast, you use more water. If you use lower pressure, you use less. It takes the same amount of time to heat up in either case. Great ideas to pass along to our children/friends/neighbors in CA who are suffering greatly this year. I would only add this caution, if it applies to your area….uncovered water outdoors in PA can become a serious problem with mosquitoes laying their eggs and the larvae that result. We need to be careful to have all those water collection buckets covered to control our mosquito populations. Just a caution……and thanks again for ALL the great ideas! In our household, what we normally do is put a bucket next to the sink. We don’t normally use our dishwasher because we find that we just don’t have enough dishes to fill it and make it worthwhile to run. So we wash our dishes by hand and save the second rinsing water into the bucket to water the garden. Many of our friends have followed our example after seeing this as in the summer months, it gets really dry and turning on the sprinkler doesn’t really put water where it’s really needed. That’s a pretty good idea! I’m not sure if you’ve considered this or not, but what if you filled the bucket itself and then rinsed the dishes in that? Then you wouldn’t have to siphon the water from the sink to the bucket. Here in Ottawa, Ontario, where we have plenty of water, but where we have a separate tax to pay for it, people reduced their consumption by about 15% over the years. So this year the city will be raising our cost by 6%, because they are no longer earning enough money to cover their costs. Less water will cost us more. Go figure. Oh gosh, I feel similarly living in California. We’ve never used tons of water (to save), but we’ve cut back even more. Despite this, they’ve raised rates! Genius!!! ..love your ideas. I’m going to round up some buckets right away. You can save a ton of water if you use a hand held shower. You direct the water so there is very little overspray and you get cleaner sooner. also, turn the water on, get wet, turn the water off. ( In winter I leave a small stream running to keep the shower stall warm. In summer I don’t do that) Then turn it back on and rinse with hand held. So efficient! Great ideas. I keep a couple of buckets in the sowers too. I have lots of cats. (Please don’t judge me! 😉 I like to change their water bowls often and I hate throwing perfectly good water down the drain. 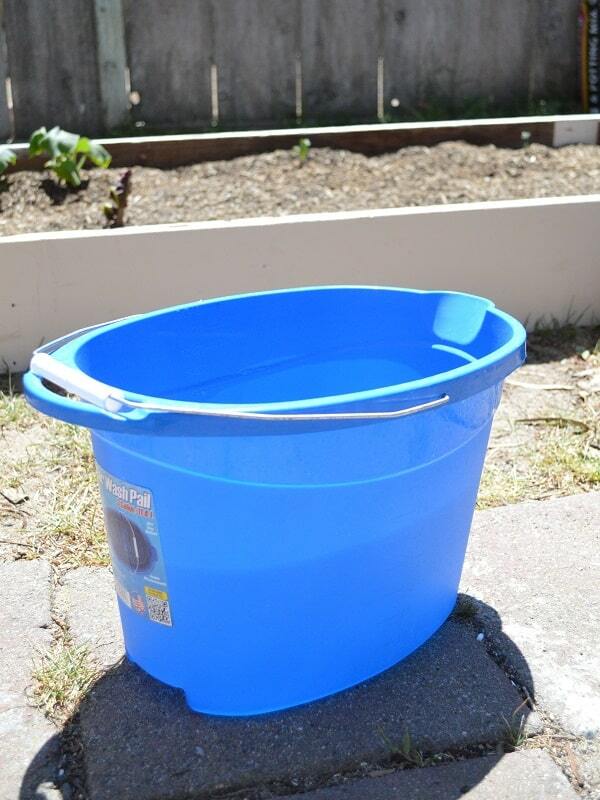 I toss the stale water in the buckets, rinse the bowls with a bit of clean water and toss that into the buckets too. It saves a serious amount of water! We’ve got a terrible drought here now, so every little bit saved is a help. I use the water from my basement dehumidifier to water outside flowers, and also have a rain barrel. Trying to get my wife to save water from the sink while waiting for hot water, but it’s an uphill battle. She does get the rain barrel idea, and wants me to make another one. Here in Milwaukee, WI, we pay for water in, and sewer out. Paying double for it! Also pay for sewer and water pipe construction fund, and for snow plowing and garbage pickup – all on the water bill! Using same amount of water as 35 years ago, bull used to be $28 every quarter, now is $158 a quarter! We take 5 min showers – get wet, turn off water, soap up, rinse off. They have really pretty buckets at Aldi this week with a pour spout & lip to help pour. Now I have a reason to go get a couple! I would not mind these sitting around the house to catch the water to recycle. I just hope my guy doesn’t trip over them! LOL, Maybe keep them in the shower while they’re not being used? Great post Tiffany. You can also reduce the amount of water you use if you plants native flowers and xeroscape. You can do that by replacing your grass with mulch or fake grass. Your lawn is likely using the most water. Just something to think about. Native plants need a lot less water than non-natives and can often survive on rainwater alone. Should you only do native plants? That’s up to you. As far as saving water for my garden, I use any tea or coffee left over at the end of the day that has no milk or sugar in it, but I will try to start using your ideas as well. Have a blessed day! Although I don’t like seeing buckets in our bathrooms, I’m starting to succomb. Years ago when officing in an architect’s building, he had mini undercounter water heaters under the restroom sinks. We didn’t have to wait minutes for the water to warm. It had to be a great savings for him and the environment. Maybe that’ll be the next purchase.